Leadership Faux Pas #10 – Don’t Be a Jackass! 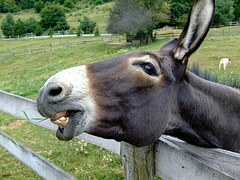 I think it is fair to say that at one time or another we have all worked for a jackass. And while we may be advancing as a civilization, I think we can safely say that jackasses will continue to take up a percentage of leadership positions in the workplace. Therefore, I thought I would compile a list of actual behaviors of leaders I have seen, experienced, or observed, over the past 20 plus years that put these leaders in the jackass stable. You let Human Resources or other people do your dirty work (letting go of people, having a difficult conversation, announcing layoffs, etc.) because you’re a coward. You make business decisions on suppliers so you can vacation regularly near your summer home … even though the vendor is not qualified and eventually hurts the business because they never deliver. You throw your people under the bus because you failed them as a leader and you’re covering your ineptitude. You micro-manage or allow your leaders to micro-manage because of your need to control others, the process, or your reputation. You fail to address the core issues that are negatively impacting your business and instead blame your failure on your peers or your people. You demean others in a way that makes you feel better than them to hide the fact that deep down you’re really insecure. You believing you and you alone can fix the problem because you’re so great and you’re the only great one who knows how, even when it is a complex issue. You create false documentation or scenarios to justify your case to terminate an employee because you simply don’t like them. Being a family member in a family business you believe you’re entitled to a position because your last name is the same as the owners even though you aren’t qualified nor do you have the experience. You stay in your leadership position even though you’re a ineffective leader and are simply buying time till you retire. You’re a business owner who cries the business is not doing well … costs are up and revenue is down … waste is out of control … and you show up with a news Rolls Royce on the day you lay-off folks (Yes this is 100% true). You buy companies and make other poor business decisions in an attempt to settle personal vendetta’s with an old colleague who is a customer and doesn’t allow you to control them. You lie and continue to lie to cover bad decisions you’ve made and then continue to proclaim your innocence even though the facts and your own words reflect the direct opposite. You exhibit extremely unprofessional behavior in a bar during a work happy hour and then when an employee complains to HR you seek retribution behind-the-scenes to cover your self-loathing. You condemn others for the very behavior you exhibit or have committed. You intentionally try to intimidate others with a behavior that is an attempt to threaten them. For example, having a container of pencils on your desk that you start snapping to let them know your upset instead of respectfully voicing your displeasure (yes this is also 100% true). You hire a coach for someone and then firing them within 30 days so you can say you tried everything knowing you already made up your mind 60 days earlier. You sell yourself out (values, morals, sense of self-worth, etc..) for a promotion or a position. Even worse than the previous behavior … you sell-out your people, your peers, or your family, to advance your career. Every single one of these behaviors is true. While I’m sure these leaders thought they were escaping the consequences of their behaviors, eventually Emerson’s Law of Compensation delivers. The Law of Compensation states that for every action in which you gain, you lose something. Some of the folks in these examples who gained initially, eventually lost much more. Some of these leaders lost their businesses or their jobs. Other leaders lost their health, their marriages, and their families. For some of them who haven’t quite experienced the full impact of their choices quite yet … it will come … it always does. It rarely happen immediately … but it always happens eventually. If you work currently work for a leader who is a jackass, chances are they will not change. So stop wasting any more of your time, talent, or energy there … GET OUT before you lose yourself completely! If you are one of these leaders described above you still have an opportunity to change your ways. It usually has to do with the level of pain you’re experiencing in your life. No pain = no change. But don’t worry … it’s coming. This is the final blog in the 10-part Leadership Faux Pas Series … we hope you have enjoyed them!